This recipe is the property of Gachatay and released under the CC Attribution-NonCommercial-NoDerivatives 4.0 license. You may not copy, derive or commercialize this recipe without following the terms of this license or the explicit permission of the creator. Chez! This is a killer recipe. I just love it. The custard comes off creamy and moist, while the cookie crust is pillowy soft. The vanilla cupcake in there sends it over the edge for me. It’s the perfect use of that flavor, and it’s actually really present at only 1%. It melds with the sugar cookie so well, and the icing note is exactly where it belongs. It definitely reminds me of those custard pies, only this is better. I can’t get enough of it. It’s my new obsession. This is probably my favorite custard recipe to date. Phenomenal job, my friend. You couldn’t have done better. Thanks so much for sharing! This is Excellent! This will easily become an all day vape for me. Great job Gachatay! This stuff is really great! I'm in the US so the fa custard premium was a bit hard to get but well worth the wait and effort. This is by far the BEST custard recipe I have ever vaped! No more Cap VC for me, this is the closest to how real custard tastes. Thank you for a beautifully crafted recipe! I got around to testing this today and it is absolutely delicious! I am going to have to keep some of this on hand for the holiday season. The real deal has way to many calories lol! Excellent recipe. Love love love this Receipe. So yummy. Tried after a week and it was very good. Let it sit for two more weeks for a total of three weeks and I can't put it down. Wow! This is an awesome custard. I love a thick, rich custard and this knocks it out of the park. I'm glad I bought a big bottle of Premium Custard. I already made another 240mls of this. Can't go wrong with sugar cookie, biscuit and graham crust. It makes a delicious vessel for the custard. Another great recipe! I can only comment on this as a snv cause i only mixed it up today. I also used inw biscuit as a sub. Omg its delicious. Im glad i have enough of the concentrates to make a lot more. Thankyou so much for sharing this recipe. If you're thinking of mixing this, just do it. You wont regret it! Update: this is my new adv, literally cant stop vaping this. I dream about this stuff its so good. 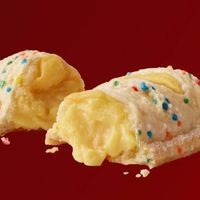 This is spot in my opinion I love the holiday pie Fa. premium custard was a good choice this is a nice recipe i will be mixing this again Good job !